I’m sure you remember the life-size Stormtrooper cake we created for Boston’s Arisia SciFi Convention back in January of this year. Well, the news spread quickly to the 501st Legion who asked us to create a life-size cake to be a part of their 15th Anniversary Celebration in Orlando, FL. Thus,we present to you Dark Lord Darth Vader -The Cake! 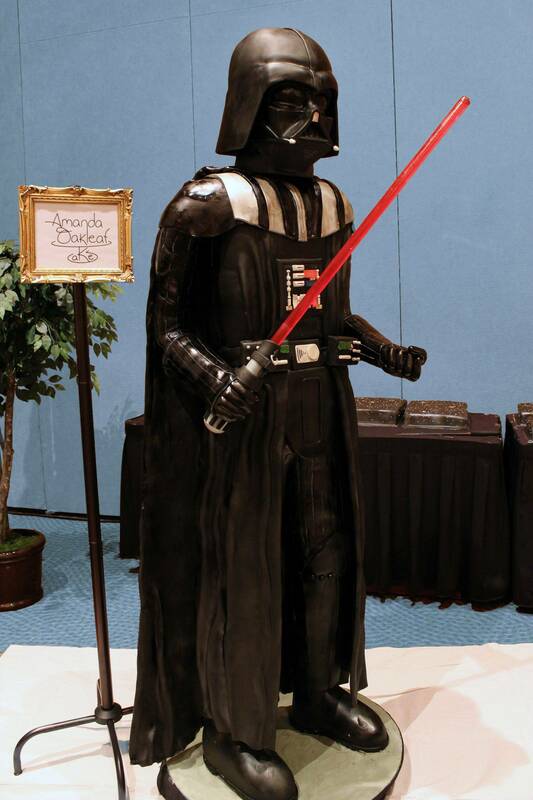 He was served at the 501st Legion Banquet on Friday night as part of the Star Wars Celebration VI event. In total he weighed just over 500 lbs, stood 6 feet 7 inches tall, and fed 600 hungry Legion members. The most interesting and challenging part of this cake was actually the cape, which by itself was over 100 lbs of our marshmallow fondant, which freely hung from his shoulders five and a half feet above the ground. Also of note is Vader’s light saber, which was a single, solid piece of watermelon flavored poured sugar. The cake was a joint donation from both us and the wonderful people at DK Publishing. Also a big thanks goes out to the 501st Legion for organizing the event and The Rosen Centre Hotel in Orlando, FL for being so accomodating! To see how the cake was put together and subsequently devoured please check out the full gallery below or at imgur. Or this fun time lapse video. I have to thank you so much for being a part of our 15th anniversary. My husband never though 15 years ago when he started this club that some day we would be eating Darth Vader at a dinner lol. Thanks again. Your cake stunned the entire banquet hall. A must epic moment for our club! Thank you so much for your hard work. He was delicious! My only question is, was it Dark Chocolate? )Small bits of content which are explained in details, helps me understand the topic, thank you! Darht Vader … jetzt gewinnen die Jedi !!! This is really impressive! My jaw dropped! Great work. Very amazing cake, Im a huge Star Wars fan! No, only continental US. Sorry.